To cite: Sohan Prasad Sha and Suman Mondal. 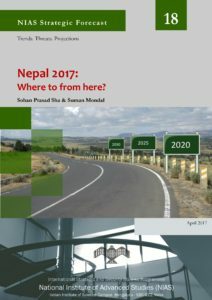 “Nepal 2017: Where to from here?,” NIAS Strategic Forecast No. 18. Bangalore: International Strategic and Security Studies Programme, National Institute of Advanced Studies, April 2017. About the Author: Sohan Prasad Sha & Suman Mondal are Scholars from Jawaharlal Nehru University.